For those who often venture in Malaysia, you might find a truck could that could show you the road ahead on a b-road particularly useful because it would be great to know when to overtake and when to stay put. 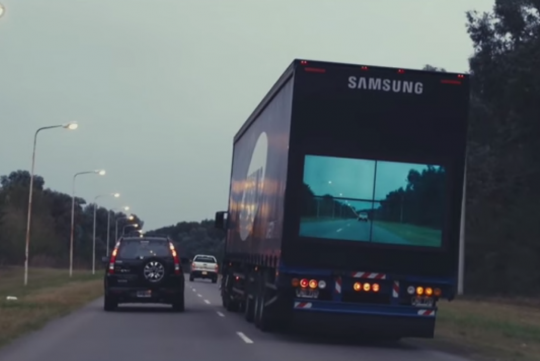 So someone smart from Samsung installed a wireless camera at the front of a truck and connect it to a display at the back of it. The screen would then display an image of what is at ahead at the back of the truck. The system also works during the night thanks to a night vision sensor, which would come in handy whenever you find yourself driving on a country road with absolutely no artificial illumination in sight. We hope this simple and brilliant idea would be implemented soon because we believe this technology could really lessen the risk of a frontal collision by quite a bit!